Security and Compliance in the Cloud: What Are the Challenges? Cloud service providers are promising companies the ability to build, dismantle, change and grow their IT infrastructures easily and inexpensively, presenting significant savings and flexibility over traditional data center configurations. However, any company that has to meet regulatory requirements is now faced with unique challenges that must be addressed prior to moving their data to the cloud. In this webinar, security expert Tom Stamulis will discuss prominent security issues, such as data protection, application security and privacy concerns, as well as new challenges unique to cloud deployments, like data lineage, encryption, data provenance and data remanence. 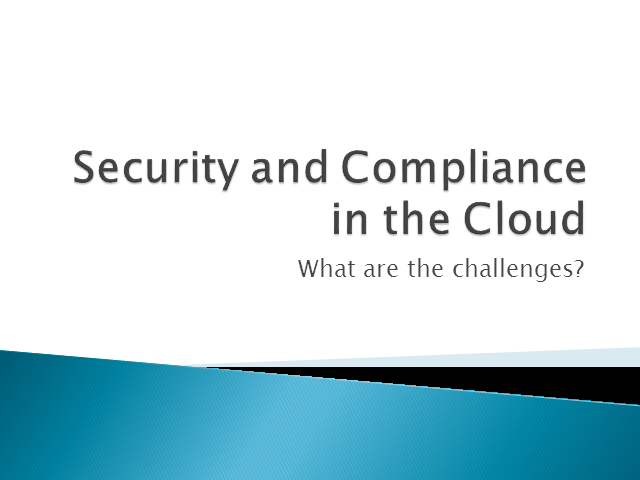 Title: Security and Compliance in the Cloud: What Are the Challenges?